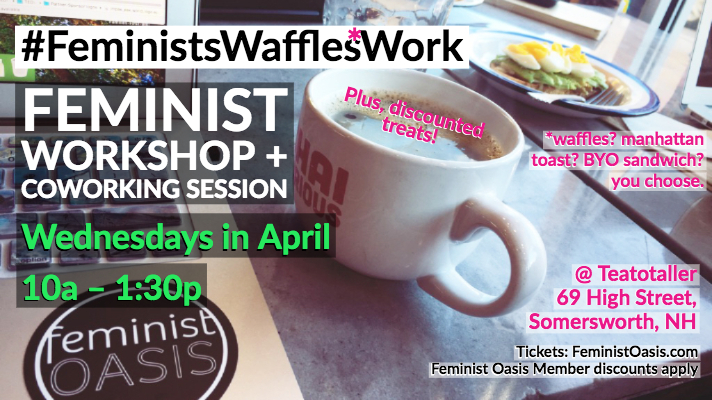 Join us Wednesdays in April at Teatotaller in Somersworth for one of our flagship events — Feminists, Waffles, Work! members, use your member discount code for up to 50% off registration! Plug into a community of feminist entrepreneurs, creatives, freelancers, artists, activists and others — anyone with “work” to do. Everyone — all genders — welcome! Since this series debuted at Teatotaller, where waffles are on the menu, the Leslie-Knope-inspired “Feminists, Waffles, Work” moniker has stuck! Even when we’re at other locations that may not serve waffles, we always make sure snacks are available closeby! We create space at the beginning for you to choose how you want to define your “work” today, space in the breaks for optional chatting, and dedicate some space at the end to raise any issues you’d like us to help you collectively brainstorm around.